For more than a year, we have received clear warnings from senior U.S. intelligence and law enforcement officials that the threat of terrorist attacks in America has increased. Terrorist attacks in Europe and the United States exacerbate these concerns. When combined with the Boston Marathon bombing, a workplace beheading in Moore, Oklahoma, the San Bernardino massacre and other horrific attacks in Pakistan, Israel and Africa, the devastating shooting in Orlando drives home the point that our current risk exposure to acts of terrorism is substantial. While K12 schools are not selected by terrorists as often as other types of targets, the fact that there have been more than 1,000 terrorist attacks on K12 schools and school buses worldwide should not be ignored. As I have written repeatedly over the past 24 months, I am concerned that the recent over-emphasis on certain aspects of active shooter events leaves our schools even more vulnerable to mass casualty losses from acts of terrorism. We have noted a definite trend for school staff to score lower in controlled real-time simulations when we have conducted school crisis simulations since the Sandy Hook Elementary School attack. While school officials missed an average of one critical action step per scenario prior to the Sandy Hook attack, they now average 1.7 missed action steps. In school districts that have used training that focuses heavily on active shooters, such as the Run, Hide, Fight video or “options-based” active shooter training programs, the performance of school staff is even worse. Schools that have adopted simplistic approaches to school crisis planning have also scored poorly. For example, school employees who have been trained in the “lockout-lockdown” approach are more likely to fumble on lockdowns during situations that do not fit a specific scenario of either an active shooter outside the building or an active shooter in the school hallway. In our assessments, staff using these methods forget about, or don’t realize the appropriateness of, calling a lockdown in more than nine out of every ten scenarios where a lockdown is clearly the best option. Just as bloodletting was a rage with doctors until it was tested, our schools have increasingly adopted emotionally-based and theoretical approaches that have never been validated as effective to the detriment of tried and true practices that work well when applied correctly. This is of special concern when it comes to the risks of terrorism and schools. The attacks in San Bernardino, Chattanooga, Boston, Moore, and Orlando combined with warnings by intelligence and homeland security officials that terrorists are deeply interested in the use of chemicals for attacks are a special cause for concern. We have found that less than 1% of the 1,000+ K12 schools we have assessed in recent years do not include hazardous materials event protocols nor the drills to practice them. When we published our book Innocent Targets – When Terrorism Comes to School in 2005, we specifically wanted to counter the alarmist and wild predictions of specific types of school attacks that have all since proven to be inaccurate. We feel that it is counter-productive to provide predictions regarding specific types of terrorist attacks on schools and school buses withour reliable intelligence information. However, our experience, research and intuition lead us to the conclusion that there has never been a time where proper all-hazards school crisis planning is more important. While terrorism is still only one of a number of potential threats for schools, it is currently at an elevated level of concern. While we offer no predictions of specific attack methodologies, timing or regions of the nation for school terrorism, our experience in the field indicates that any approach focused heavily on any one attack methodology is unreliable. Many major terrorist attacks use multiple weapon types & tactics, as evidenced by the Paris attacked that used coordinated attackers with bombs and firearms, as well as the Beslan school hostage crisis. 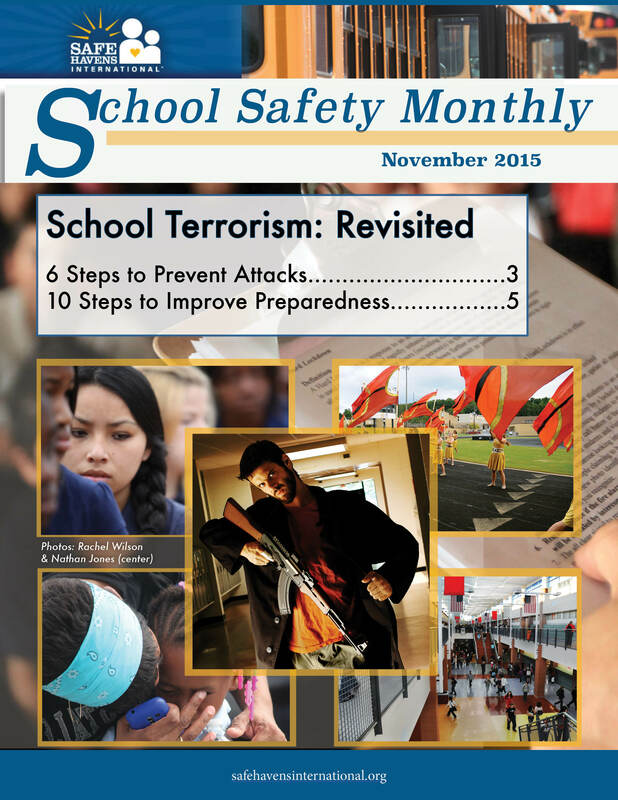 When it comes to planning for school terrorism, the key is to focus on the basics. The skills needed to respond to an incident of school terrorism are the same toolkit you would need to respond to other mass casualty events. The emergency functions – lockdown, evacuate, shelter in place, etc. – are the same whether the incident is caused by an industrial accident that could take thousands of lives in minutes or a terrorist release of hazardous materials. Providing staff with the tools, the empowerment and the drills to practice all of this is critical.